There are reasons why I have taken the mantle of The NPC over the years, and my habit of learning and running games is the primary reason for it. While I do enjoy running games, I do miss the opportunity of playing, but my chances of playing anything tend to plummet as more and more games need someone to teach, help govern the rules, or even play a GM-like role. That was one of the reasons why I was wary about trying to pick up Descent. I played a session of the game years ago and found it interesting, but knew if I dropped the money on the game, I’d have no chance to be a player and it’d be just like running a standard RPG. Then I was introduced to the Road to Legend app to give it a whirl and offer feedback, and that changed my view of things and gave me some hope for the future of this type of game. 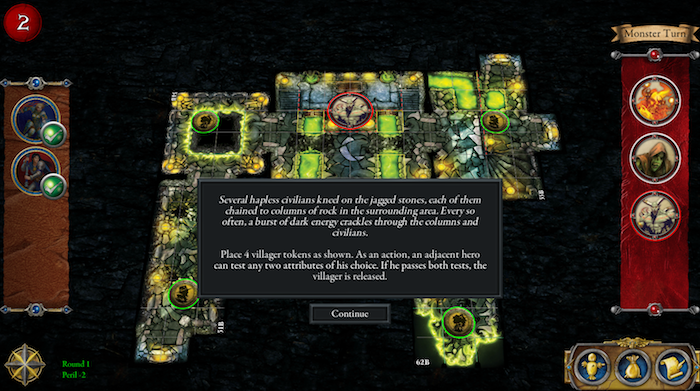 Descent is a board game currently published by Fantasy Flight Games. The game is normally played by a group of players taking the roles of heroes and delving into dungeons, often run straight from the book or sometimes designed by another player that takes a role similar to a Dungeon Master. It’s one part cooperative, as the heroes are working together, one part competitive, as the heroes are trying to clear the dungeon and get all of the associated loot and related rewards. The core game plays like a campaign, with progressively harder missions as the book progresses, and the heroes gain the means to take on the challenges with gear, magical items, and of course, the obligatory XP. Road to Legend is a companion app to Descent, which takes the weight off the the player that would be the de facto GM and allows them to become a player instead. The app stores all of the necessary maps, monster data, will track the various bits of the adventure (and adventurer’s progress) for you, and will even read things to you. It really is a scripted GM! As long as you have a copy of the Descent core game and a device that can run the app, you’re ready to go! Okay, let me clarify: I tend to be the guy that’s constantly running games. If there’s a tabletop game, there’s a high percentage (80%+) that I’m behind a GM screen, and unless I’m playing a demo at a con for the first time, there’s a 90+% chance that I’m the walking rules encyclopedia for just about any game I’m playing. Knowing that, for once, I can play a game without having to do more than know my character and maybe take my turn to poke at a screen/relay info from said screen…that’s almost a miracle. Obviously, the game is a scripted GM based around which adventures are available and which expansions you’ve purchased. 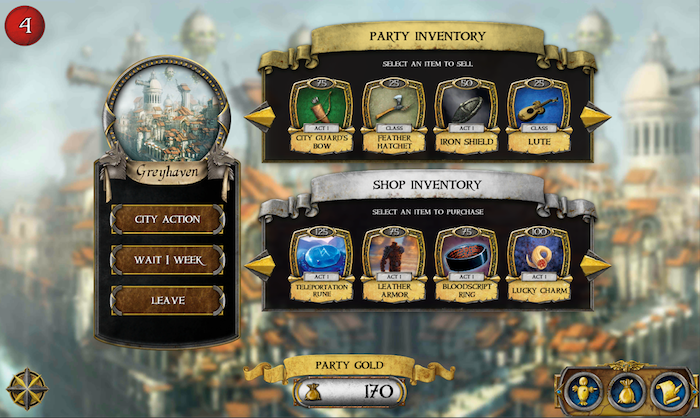 Additionally, the app comes with a new campaign which teaches you how to play the game while interacting with the app. The app also includes the means to add further expansions. 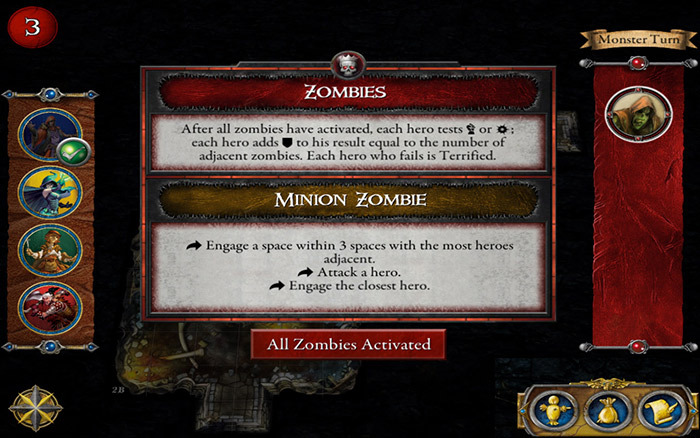 After you purchase another one of the expansions of the Descent line, you can add it to the app, and it will register that you have access to resources (tiles, creatures, etc) of that expansion. This means that, in some adventures, you might run into a creature from an entirely different expansion, which makes things rather interesting. As I only worked with the core game, I didn’t get to see this in action, but the premise alone is rather interesting to me. A shot of the map and text in action from the Delve expansion. Additionally, FFG is often adding new adventures and campaigns for each expansion, and these are completely free to download. Therefore, as long as you have access to the expansion and download the adventure to your device, you can play it whenever you are ready. There is another feature of the app called “The Delve.” While this is a paid expansion to the app, it creates what appears to be a randomized adventure based on which expansions of the game you own. While this isn’t a full-blown campaign, it is a rather interesting idea for a short session to kill an evening and to prolong the usage of the game. Normally, when playing Descent, you need at least three players (a GM and two heroes), but with the GM position removed, you only need one other person to play. As someone who has problems getting a proper gaming group together most of the time, this is a great thing to have for smaller groups that want something different to do. You get instructions for the monsters. No need for a GM to be there, and no feeling like the GM is picking on you! One of the best perks of the app: the core app is free. You don’t need to buy anything, and it is available in app stores. How is this a bad thing? While the app advertises that you only need to read a small portion of the rules to understand the game, I have to disagree. I’ve realized the hard way that while you might be able to get away with the basics in the Road To Legend rulebook, there are points that make much more sense when you read about them in the core rulebook that comes with the game. Personally, I’d say have someone at the table that has read both and have everyone else read the short, online rulebook and you should be good. I’m not so sure how I feel about The Delve being a paid expansion to the app. The game and it’s associated expansions are already pricey, so $4.99 may not seem like much, but it’s another blow to the wallet when you think about it. At least in-game shopping for gear doesn’t involve microtransactions like some other games, ne? At this time, there isn’t that much content out for Road to Legend. We have Rise of the Goblins (Tutorial, core game), Kindred Fire (core game), Nerekhall: Seeds of Corruption (requires Shadow of Nerekhall), and The Delve (random dungeon based on what you own). I would love to see more options, or even a way to players/GMs to create their own to add in to share with other groups, but for now, if you want the most out of the app, you’re paying $4.99 on top of buying all of the expansions. Due to the nature of the app, I refuse the grade it. Descent itself is a great game, warranting a solid 4 bun rating due to it’s very nature as a “board RPG” that allows groups to game with little prepwork and without having to have everyone read large numbers of rulebooks. If you already have Descent, you would be doing yourself an injustice by not downloading Road to Legend. Even if you just go through it and use it as your adventure guide, it is well worth your time to look into and use. Road to Legend is available on Google Play and the iTunes App Store. Descent: Journeys in the Dark Second Edition is available at most game retailers and via FFG’s webstore. I’ve had a large number of things arrive lately, with more items shipped that I am tracking and awaiting the arrival of. There are also a few other events on the docket that are coming up, ranging from card tournaments to conventions, so there’s quite a bit going on. Open Legend RPG. The PDF just went out to backers during the first week of June, and it is looking good. I need to spend more time to finish reading it (it’s a short document compared to some of the others), but it is looking good. Blades in the Dark, by John Harper and released by Evil Hat. My Special Edition copy just arrived, and I will be able to start reading it soon. What I saw of it before my tablet went wonky, it has a great bit of potential, even if just parts of it are pulled into other things. I put in my order for my Pirate’s Booty Box for 7th Sea Second Edition, as well as my GM Screen. While the maps originally slated as part of the collection are not available and their timeline is currently TBA, John Wick Presents went ahead and put the rest of the “booty” together in a single order. I should be getting these items in by June 15th, and plan on having a review of them in the near future. The total review includes the GM screen, the Hero and Villain decks, the Sorte deck, a set of dice, and a set of tokens. A friend of mine taught me how to play Weiss/Schwarz at Tekko this year, and may be able to get me into a tournament later this month. Due to my looking at things within the game, I’ve put together a collection of my impressions of the game to share with you all. My playtesting schedule is slowly winding down as I finish submitting some final reports from my most recent playtest. I’ve been collecting a number of thoughts over the various playtests, both open and closed, and decided to write up a small bit about that process. I’ll be sharing with you all my experiences on that topic at some point once I finish getting all of the thoughts in a coherent post (and review everything to ensure I’m not violating any of the NDAs that I have signed). As you can see, there’s much to be excited for, so stay tuned for more!